Please critique Brad's Twitch Tool! This is my Twitch app here : https://blbaylis.github.io/Twitch-Tool. I want to use this in my portfolio, so I tried to go the extra mile. What do you like about it? What do you dislike about it? How could it be improved? Edit : In hindsight, should I just have posted in the let’s discuss thread instead? I like the extra features, but the overall design seems a little rough around the edges. I think you should round off some of the squares and maybe add some shadowing to create more depth. One thing I particular do not like is if I have scrolled down the page when viewing any of the three tabs and then click on either FCC’s Streams or Brad’s Streams. When I click on one of those tabs, the whole page jerks up and then back down. When clicking on the Twitch Featured tab, it does not do this. Thanks for the feedback, very helpful! I did start out with the tabs themselves having rounded corners, but decided against right at the end so those are obvious candidates. I think the container of the streams could certainly be rounded nicely too. I don’t personally like the idea of rounding the corners of the stream thumbnails though, what are your thoughts on this? I do have some shadowing on the page, on the search bar and around the aforementioned container of streams, but I don’t have very much experience and wouldn’t say i know how to use them well. Was it the case you didn’t notice these shadows because they weren’t prominent enough or well done enough? Or do you mean more shadows should be added on top of the already existing ones, for example on the stream thumbnails? As for the jerky tab switching, I’m not sure why I’ve settled for that, I should definitely do something about that! Thanks again for the feedback and also help you’ve given me for this project on the forums, it’s all much appreciated! I think there is too much text and it makes it look busy. I think each channel needs some kind of border that separates the text from one channel from almost bleeding into another channel. I think another thing that would help is more colors other than white and purple and I do not count the user logos as different colors. Maybe there should also be more contrast in the font sizes. There has to be a better way to show which main tab and sub tab you are on without using those underlines. I will draw something up as a concept and see what you think. Give me a couple of hours, because I am working on a few other things right now. These are just some things that pop in my head when I look at your project. I think it has the potential to be one of the best Twitch projects I have seen. What about something like this? 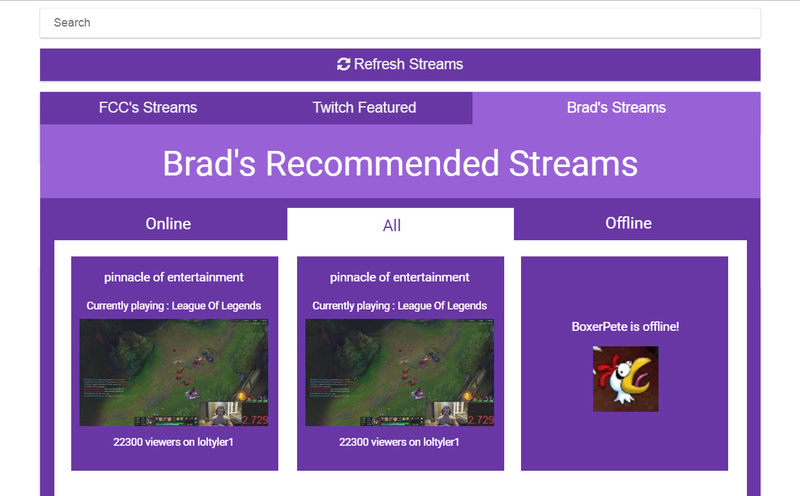 The main tab’s color leads into the content (Brad’s Streams in this case). The sub menu (white background) leads into the current active content being displayed. It is just a thought. There are better ways I am sure. I think a bit more colour to break things up a bit is an excellent idea! I really didn’t like the underlines either, I considered making the active tabs white, but it didn’t work with the already white background for the tabs. In hindsight though, I don’t know why I’ve trying to lock myself so strongly into just white and purple. Thank you very much for taking the time to make a mock-up, this has given me a lot of thought for thought. I especially like the brighter shade of purple for the active tab! Edit : I’ve made some changes based on your feedback, check it out! I haven’t resolved the jerky tab switching yet that may take a little longer.